President Donald Trump announced Monday that he donated his first quarter salary of 2019 to the Department of Homeland Security. 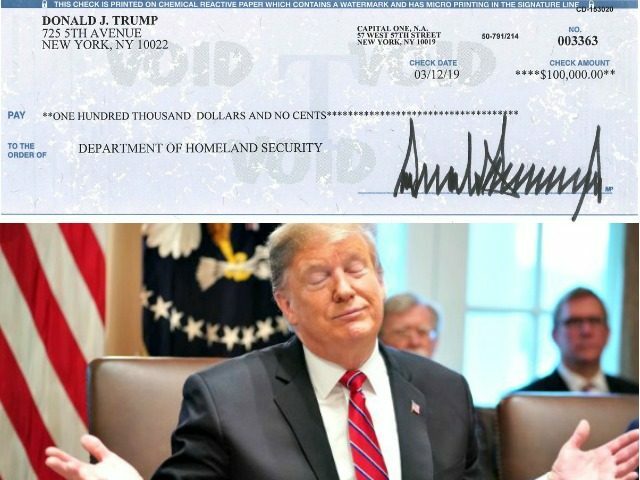 The president shared an image of a check written to DHS for $100,000. Throughout his presidency, Trump has donated his quarterly salary checks to help fund the Departments of Transportation, Interior, Health and Human Services, Veterans Affairs, and Education, as well as the National Institutes of Health and the Small Business Administration. The president promised voters in September 2015 that he would not take the annual salary of $400,000 if he was elected President of the United States.